An increasing proportion of our members are looking into print lately so it could be useful to have a big thread which compiles all these different places. There are a lot of different categories for this subject so I've tried to split them up in a way that makes sense to me, though if anyone reading this has suggestions for changes I could make please feel free to suggest away! This sort of thread is most useful if it's being continuously edited and updated to reflect more companies and resources (or to take them off, should they close their doors for whatever reason). And of course, if you know more printers or have more information on any of the ones listed here, please let me know! (Or for those of you with editing capabilities I guess you could just add them). Latest update: March 8, 2019. Added 4 Over 4. Minimum of 25 books, but will do up to 2500. Also offer posters and flyers. Good quality. I haven't done business with them but I'd recommend them highly on the basis of their communication, and I've heard good things from people who've worked with them. Minimum order is 25 copies; they allow price matching. Minimum order is 6 copies. Floppy comics only (under 'booklets'), minimum order is 1. They also do postcards and posters, including large-format. 25 copy minimum, good turnaround times and quality, though they've recently increased their prices for short-run comics. (The 'Shenanigans' minicomic was printed through these guys). They do both long and short runs. 10 copy minimum; short and long run printing of both issues and trades. 2 week turnaround time and very high quality stock. No fees for reorder changes! They do both long and short runs. This is Amazon's print-on-demand publishing arm, so a book printed here will automatically get an ISBN and be listed on Amazon. Quality can be variable and apparently their customization options are limited, although depending on what you're after it can still work out just fine. I've seen books printed through them come out great. Previously known as Mira Booksmart. Little known data on them after rebranding, but they still feature ‘graphic novels’ as an option in their product listing. Their turnaround time as Mira was 7-10 days. I've seen these guys get recommended all over; quality is decent. Turnaround time is listed as 5-6 days, but they offer 3-4 and 1-2 for about $1 and $2 more per book respectively (not bad for a rush fee!) They have a 100-book minimum. I've heard good things from people who've printed with them, though as a personal anecdote I tried to contact them about shipping to Canada (their forms don't include an option for international shipping) and they never replied at all; if you can raise a response they may be a good option though! 25 book minimum with a one week turnaround. Proofs are $30. Very well-known. They have no minimum order and fast turnaround times. Print quality is mediocre and paper options are limited. Not always responsive. They do give you a space on their online store (indyplanet), which is a potential bonus. They have an option where you can get a discount by allowing them to place an ad for their services in your book. There is an in-depth review of their print quality here. They do both primarily long runs, but do offer digitally-printed short runs as well (hence being listed in this section). They offer custom options such as hardcovers and gilding-- may print outside of the US though, so shipping times may be longer. Newish company, good prices and very fast turnarounds. No minimum order. These guys are not known for low prices on their short-runs but they are known for good quality. They also do both long and short runs. Good quality, do both long and short runs. Prints, short comics. Minimum order of. Maximum page count is 48. I don't know anything about them (their website doesn't have much information), but they could be worth emailing for a quote if you're looking for a UK-based printer. They're great to work with. Their minimum order is 250, though at 250 copies many of the POD options are still competitive with their prices. They also offer this handy checklist for customers as well as a great FAQ section about paper weights and printing options. Standard turnaround is 6-8 weeks with the ability to expedite orders in 2 weeks. The books are printed overseas, so all books need a 'printed in China' note. Good rates, offer variant covers and hardcovers at low prices. *Very long shipping times, low communication from owner. Minimum order and pricing competitive with Print Ninja; their website is less intuitive and friendly, with most of the information coming from direct communication (via phone or email). All their printing is done within North America, so shipping times are much faster. Very good quality and a lot of options for paper and finish. These guys specialize in comics and only do long runs. They were also the only company who quoted me with a set up fee ($50) which includes a proof. 7-10 day turnaround time for printing and very nice looking samples. They have their own online store for selling the comics they print called ComicFleaMarket.com. Offers both offset (long run) and digital (short run) printing. Digital printer that can handle both large and small orders at reasonable prices. Quality can be variable though. Accepts mature content. Another overseas printer; so slow turnaround times, but good prices and great quality. Lord Sticks-a-lot - Sparkly Holographic Sticker options! CatPrint - Sparkly holographic print options! Printed our bookmarks for the SpiderForest Kickstarter. Could potentially do comics, via their 'booklets' or 'manuals' options, but may not be ideal-- though they have no minimum order and their rates are low. They also offer business cards, postcards, posters, calendars, and assorted other paper-based material. Business Cards: Color glossy cards starting at $7 for 100. You can add rounded corners or special shapes for usually only a couple more dollars. Bookmarks: Two sizes available (1.5" x 7" and 2" x 8"), starting from $7-$10 for 100. Banners (this is where the SF booth banner came from): Lots of size options; a 2'x6' banner runs around $22. Pretty well everything you can think of: cards, stickers, apparel, tote bags, giclee art prints, and so on. General paper print goods (business cards/postcards/posters) with minimums around 500-1000 copies. Lots of styles of convention banners. Business cards, greeting cards, postcards, etc. Very good quality. Banners and large promotional media. These guys seem to do a whole bunch of things, including stickers and laser-cut charms. Oooh, great idea! I'll have to check these out; I haven't heard of a lot of these places. I'll add QuickComics for short and long run printing of both issues and trades. They have a guaranteed 2 week turnaround time and very high quality stock. They're located in Nashville and Craig is a top notch dude. Very awesome to work with. Minimum 10 copy order. No fees for changes to reorders at all. Star Cross'd Destiny - Blair B.
Yea, thank you so much for this list. I was freaking out of where to get a print done. I'll also throw a note out that if you want something that's basically "a rectangular thing on postcard stock or thinner that is smaller than 11x17" (postcards, prints, business cards) and you want like 20 copies or fewer, go on Yelp and search for printers in your neighborhood and ask for a quote. It'll save you on shipping, you can ask for small quantities if you're still trying to figure out how much merch you need for conventions, AND you can also support a local small business (which is always a rad thing to do)! * Printers that are not FedEx/Kinkos are my recommendation, because those guys will charge you up the nose for everything. I needs this right now D8 thanks for making the thread! Trying to finally see about printing my first volume and setting up a store. Just wanted to show some tangible proof of how awesome this thread was, this is the first time I've ever seen my professional work in physical form. I'll vouch for Printninja being good for large runs. I used them once, they were very easy to work with, and the product came out nicely. They sometimes booth at conventions I'm at, and once in a while members will leave their booth to come say hi to me.It's possible they are only doing that to encourage future business but it's nice, and I appreciate that personal touch. Overnight Prints has also been pretty good to me in terms of posters and postcards, but if you want a small run of prints Delphina is right that it may be better to find a local printer. Smaller independent ones with decent reviews might cost more than a Kinkos but some of them make some nicer looking prints. When I lived in Portland I would use Copyman for 11x17 prints - they came out more vivid than at Kinkos. I'll try some of the sticker and button places recommended on this thread if mycurrent Kickstarter reaches its funding. Thanks for the list! 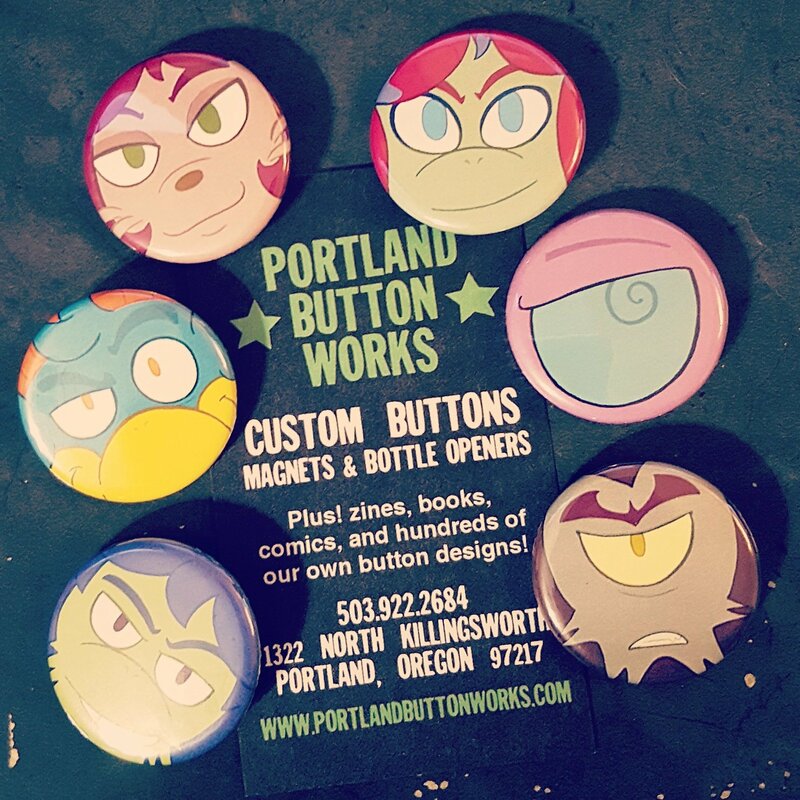 This is my second order from Portland Button Works, and I suggest if you want buttons they're the way to go. Good deals, good service. I noticed that Lithoninja (not to be confused with Print Ninja) wasn't on the list! They're my favorite comic printers! Their prints are gorgeous, reasonably priced, and they ship reasonably quickly too! Plus they have a 25 comic minimum!